Welcome to our blog. Here at Charity Gift Fair our aim is to inform, and educate as well as share all the fab things we have going on at our next event. The main charity we support is the Bobby Moore Fund for Cancer Research UK. 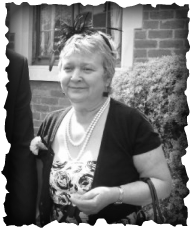 This is due to us losing a very dear member of our family to bowel cancer in 2012. Bowel cancer is the 2nd most common cause of cancer death in the UK. 1 in 16 people will suffer from bowel cancer at some point in their lifetime. Since the Bobby Moore Fund was establised in 1993 the mortality rate has decreased by 30%. Thanks to events like ours, the Bobby Moore fund for cancer research UK has been able to help fund ground breaking research into saving peoples lives. My Mum had much longer on this Earth thanks to the research that the Bobby Moore Fund has funded. Unfortunately the disease was caught too late and we lost her on the 9th May 2012. It was like all our hearts had been ripped out and stamped on. We have been fundraising ever since she passed away as we don't want other families to suffer the way that we did. The good thing about my Mum was that she knew how to throw a party! This event is being held in her memory and we would love you to come along and have a fun day with us, and all the time raising awareness and much needed funds for the charity. This event is being organised by volunteers - we will do everything in our power to ensure that the event and its entertainment will go ahead as planned. However we will not take any responsibility for the event/entertainment being cancelled due to circumstances out of our control.